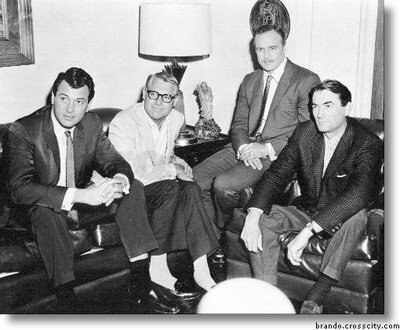 Rock Hudson, Cary Grant, Marlon Brando & Gregory Peck. L-R: Rock Hudson, Cary Grant, Marlon Brando and Gregory Peck. I didn't ever think I would see all of them together in the same picture!. Wallpaper and background images in the ক্লাসিক চলচ্চিত্র club tagged: classic movies classic actor. This ক্লাসিক চলচ্চিত্র photo contains ব্যবসা উপযোগী, সুবেশী ব্যক্তি, মামলা, প্যান্ট স্যুট, pantsuit, মামলা, and জামাকাপড় মামলা. There might also be রাস্তায়, শহর দৃশ্য, শহুরে, সাইন, পোস্টার, টেক্সট, চকবোর্ড, and বৈঠকখানা.